It’s no secret that we did a LOT of research about every aspect of our trip before we ever set foot on a plane. It took Kevin eleven months to find the right pair of pants, for crying out loud. Thankfully, however, my research was a little more fun; I recorded every show I could find that had anything at all to do with Africa. I spent my eleven months learning about food, culture, wildlife…..you name it (by the way, if you haven’t seen the Tanzania episode of “Bizarre Foods with Andrew Zimmern”, you should. It *really* had a lot of information that came in handy). 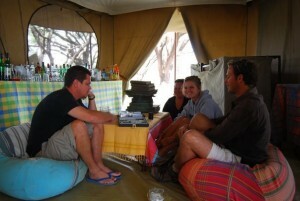 The day we received our itinerary from Royal African Safaris (ask for Bobby! ), I took to the internet and learned about all the places where we’d be staying. We were especially excited about staying at Ol Malo, since we knew we’d get to experience the Samburu culture in an intimate setting. The trip to the market was an unexpected added bonus, and it left us thirsty for more. When we got back to the lodge, lunch was waiting for us (more accurately, it was a late-afternoon snack since lunchtime had passed long ago, but it was delicious nonetheless). Hussein had gone to visit some nearby manyattas to find out if there was anything going on in the evening, and, as usual, he didn’t disappoint. After we freshened up a bit, we hit the Rover one more time and headed out just before dusk. This time the drive was only about 15 minutes; our route took us onto the “runway” at the “airport”, which was nothing more than a wide dirt road. We were highly amused to see four giraffe wandering around on the airstrip. That’s certainly not something you see everyday. 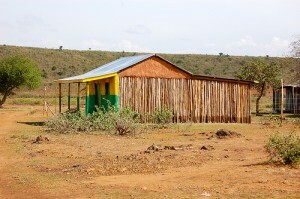 Soon, we pulled up and parked just outside of the manyatta whose residents would be playing host to us. We stopped just outside of the boma to meet the elder; Hussein passed our thanks along to him, and he welcomed us to his home. Hussein was an invaluable resource of Samburu cultural knowledge, and he encouraged us to ask any and all questions we had. 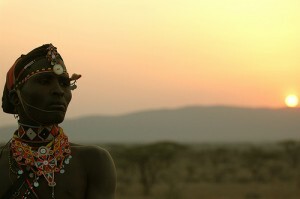 He patiently explained how the Samburu social structure is based on age-group. 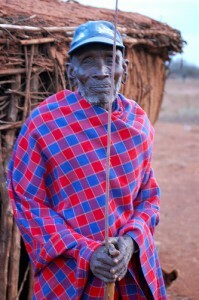 When a Samburu warrior achieves the status of elder, he’s allowed to wear a hat. It can be any hat of his choosing, from a WWII helmet to a John Deere ball cap; regardless of the style, it’s a sign of honor. The younger warriors, known as Morans or Il-murran, are typically between the ages of 12 and 25, and they dye their hair red for ceremonial dances. Having paid our respects to the elder, we made our way past the goat pen, through the entrance of the boma where the warriors were already fully engaged in the traditional “jumping dance” which is part of the courtship ritual. The young men show off their skills to a group of ladies, who then select their partner. The men sing and the women provide the rhythm by moving their necks back and forth so that their massive necklaces create a sort of drum beat. We were encouraged to get closer and take lots of pictures (in fact, at one point Hussein scolded us for not getting close enough! ), so we moved around the area snapping photos and shooting video. The girls were focused on the warriors’ dancing; they were whispering and giggling to each other. While I didn’t understand the words, the language of flirting is universal, and those girls were fluent. It was clear that they were determining who was the best match. 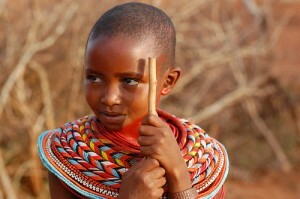 The girls ranged in age from 8 or nine to about 16 or 17, but it was the youngest girl who caught my attention. All the girls were stunningly beautiful, but the littlest one had an almost haunting quality about her. She was actively participating with the others even though she was obviously years younger. She wasn’t the least bit shy, though, and she chose her partner and joined the dance. The girls embodied joy and grace while the men worked hard to impress them. Kevin, who was up for anything, had asked Hussein if he could dance, too, and it was all arranged. One girl graciously forfeited part of her dance with her chosen warrior and led Kevin around the circle. Everything may have rhythm, but not everybody dances *well*. Kevin sure gave it a great try, though, and I was proud of him for embracing the experience. Hussein then led us into the elder’s house to meet the first wife and learn a little more about the culture. We ducked our heads, made our way in, and settled around the fire. There are no chimneys in these huts, so it was quite smoky. The smoke, however, served the purpose of keeping insects outside, and the warmth from the fire was essential at night; once the sun goes down, it gets quite chilly. Hussein explained quite a bit about the Samburu diet (again, a big “thank you” to “Bizarre Foods with Andrew Zimmern”, since we already had some idea what to expect). The staples of the diet are blood and milk, which is why their cows and goats are so important to the culture. Goats have their jugular vein pierced and the blood is collected for consumption in hollowed out gourds (Hussein even explained how the arrow must precisely pierce the vein so the goat would not bleed to death. He even let us touch the tip of the arrow!). The vein is then either sealed with dung or cauterized. The goat recovers and is no worse for wear. 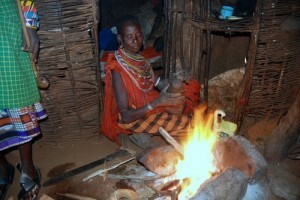 The elder’s wife was busy sanitizing a gourd with smoke from the fire. This particular gourd was dyed black which designated it as a vessel for carrying blood (in fact, it was dyed with cow’s blood). 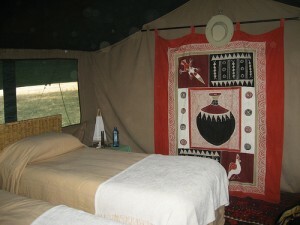 We were seated on a raised platform which was the entrance to the sleeping quarters. As many as 15 people sleep in this one small area. “Mattresses” are made of cowhide, and pillows are made of carved wood and look like little stools (these actually reminded me of the platforms that geisha use so they don’t mess up their hair, and they certainly didn’t look comfortable). The area around the fire served as the kitchen, with the cooking utensils stored in a built-in cubby on the wall. There was one other semi-walled room; this is where the elder shared a bed with his wife when he chose to sleep in this house (he had other wives with other houses, as well). We were feeling a little light-headed because of the smoke, and we had the answers to all of our questions (they were SOOOO patient with us and thirst for knowledge), so we headed back out to thank the elder one more time and shoot a few more pictures of the warriors and their ladies at sunset. 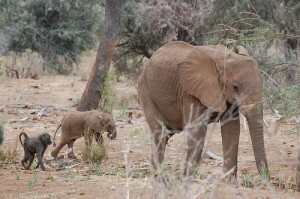 By now, there were a few young children hovering around the edges of the boma. 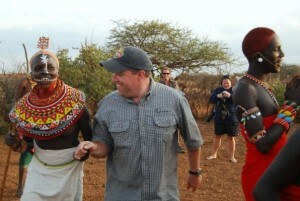 A few of them were practicing their dance moves, and ALL of them were curious about us….especially our cameras. Kevin knelt down and showed them some of his pictures, but I was more interested in getting them on film. They were the happiest kids I’ve ever seen. Standing in the circle with the warriors and the women, with the sun sinking down on the horizon, listening to songs sung in a language so foreign and yet familiar, I was once again overwhelmed with the realization that what unites us is so much greater than what divides us. Music is a universal language, laughter and a smile are currencies anywhere in the world, and everything under the sun really *does* have a rhythm. Everything dances. 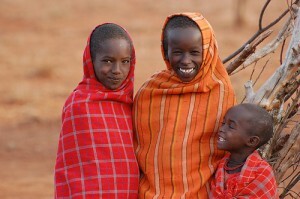 An African proverb says that “Seeing is different than being told”. Truer words have never been spoken, and I feel like, at this point in our story, no words I say would begin to do our experience justice, but I’ll try. 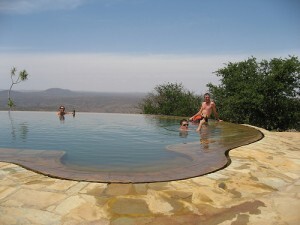 We congregated back by the pool where Andrew had a surprise for us; Julia (his sister) had heard that it was a Market Day, and she was headed over there to introduce two new teachers to the Samburu culture (never fear: There will be more on Julia and her school in a later post). It wasn’t an experience that they normally offered, but did we want to go, too? Um….are you KIDDING?!?! We loaded up in the Rover and headed out. The “20 minute drive” took about an hour, and we not only got to see a lot of wildlife on the way, but we also got to drive through the village of Kirimun, which was home to Hussein, our awesome Samburu guide. In fact, Hussein was about to open a shop there. , and he let us take a picture of it! Side note: Later, back at the lodge, I looked at my map of Kenya, and I could not believe that Kirimun was on there; when I say “village” picture a few buildings on either side of a wide dirt road. Again, seeing is different than being told. Eventually, we began to see increased foot traffic on the side of the road, including lots of young boys herding their goats (Samburu boys start herding goats at the age of three, so some of these boys were quite young). Hussein told us that these people had just come from the market. Sure enough, just after we passed a van and crossed over a ridge, we arrived at the market. Andrew told us that we really shouldn’t take pictures, but (unbeknownst to us at the time) he hung back and snapped a few pictures with my camera. We set off with the ever-knowledgeable Hussein as our guide. We wandered past men selling goat hides and into the heart of the market itself. There were “booths” fashioned out of acacia branches, and people were selling just about everything you can imagine. The blacksmith had set up shop under a tree, and he showed off his wares while Hussein explained them to us. There were lots of different cowbells (and goatbells, for that matter), some spear heads, and more than a few bracelets (these had been fashioned from cooking pots, or jiko, that had been melted down). Each bell had its own unique sound, so that once they were tied to the goats, each boy could easily identify his own animals. Hussein was eager to show us the most important part of the market, so we made our way over to the livestock pen. Since it was late in the afternoon, the only animal left was an ornery bull; all of the other goats and cattle had been sold or traded. By this time, we had attracted a rather large following; we had been told that this was the first time most of the people had ever seen a white person, let alone a group of them. The children were curious, and although they were a little bashful, we had a good time waving, smiling, and winking at them. The women were stunningly beautiful, and it was all I could do to mind my manners and not stare at them. A few people reached out to touch us, but most just watched us or followed our group. Hussein was doing his best to keep us on track, so even though we would rather have stood stock still and just taken in our surroundings for the next, oh, 5 hours or so, we sucked it up and followed him over to see the cobbler. Every tire in Kenya is recycled. The rubber goes to the cobbler who fashions shoes known as “thousand milers” from the old tires and a few strategically placed nails. Every man we saw was wearing a pair of these, so the cobbler had a pretty decent business going on. Next to him we saw a few booths selling clothing, some selling toys, and, most entrepreneurial of all, a booth that specialized in charging cell phones. If you needed a charge, you could leave your phone with these gentleman, who would plug it into one of MANY power strips powered by small portable generators, and go about your business (maybe even visit the booth next door and get a haircut at the barber). Business was brisk at the charging station, to say the least. We all had one deep desire, though, and that was to buy a kikoi. We had given Nic such a hard time about his choice of attire every evening, but secretly, we were all coveting his skirt-like wrap. The kikoi is best likened to a sarong, but it’s really so much more than that (in fact, Katharine can list well over 100 uses for a kikoi). We finally found what we so desperately had sought…..a whole booth dedicated just to kikoi! Andrew came through for us in a big way; he told us that we could all pick one out, his treat. We deliberated over color and pattern, and ultimately, each chose the best one: Katie and I got matching hot pink ones, Dana chose a muted green, Dad selected burgundy, and Hussein chose a bright green one for Kevin (which, by the way, he’s wearing as I type this). Julia found us, and she introduced us to the two brand-new teachers who had come from New York to teach in her school (don’t worry; there will be a lot more about her school in a future post). One young boy pulled Julia aside and asked if she thought three cows was a fair offer….for Katharine’s hand in marriage. She told him that he’d have to ask Dad, but I think he was more than a little intimidated by the tall white bwana, so he just continued to follow us around. We made a few more stops, learning about “khat“, or, what the purveyor described as “american whiskey”. Khat is a plant that, when the leaves are chewed, has an effect similar to that of cocaine. Never fear; despite the salesman’s best efforts, we all politely declined. We walked past a few more booths where women sat beading (again, there will be a LOT more on the beading in a future post), and Hussein explained that some of the small buildings made of acacia branches were called “hotels”. There were not roofs or walls, just thorn branch huts that serve as a place for people to gather and have drinks and a visit. Finally, though, we made our way back to the Rover. It was 3:00 in the afternoon, and we were just beginning to realize that it had been quite a while since we’d eaten breakfast back in Buffalo Springs. After a brief mishap with Julia’s Rover, we were on the road back to Ol Malo. At this point, I think it’s extremely important to say that the above description in NO WAY comes close to delivering the experience. There are not enough pretty words to describe how absolutely life-changing it was to visit that market, see the people, and learn first-hand about a culture that is so completely different and utterly fascinating. A simple narrative is not nearly enough to convey how profound it is to stand in the middle of a dusty market halfway around the world and feel so welcomed and warm in spite of so many differences. I will always wish that I had the ability to tell this story more eloquently, but I take some comfort in knowing that, even as I sat down to write this today, I still felt as overwhelmed at the memory as I did at the time of the experience, and I can honestly say that I have full understanding of that African proverb. “Seeing is different than being told”. Indeed. Things got raucous after dinner on our third night, due in large part to wine and Bobby’s dice game (for the record, nobody understood Bobby’s dice game, and it required a substantial amount of math). There was some bold talk about the potential to be aerial daredevils on our next flight (Kevin and Nic were a little nervous), more wine was consumed, and we finally headed for the tents and some sleep. We got to sleep in for the first time….Our wake-up call came at 6:30 instead of 7:00, and after coffee and a small breakfast, we headed out for our final trip through Buffalo Springs and a search for lions on our way to the airstrip. 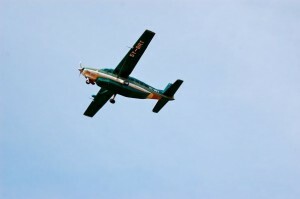 Our pilot was running a bit late, a happy accident that gave us a little more time to spend in the reserve. Bobby spotted some rather large lion tracks down by the river, and we followed those for a bit; soon, the radio crackled, and Nic told us that Lepeta had managed to spot part of a pride just up the road. We scrambled over as fast as we could, and sure enough, there was a mother lioness and three of her cubs nestled in the scrub. Nic’s Rover definitely had a better vantage point; in fact, Bobby declared it only a “partial sighting” for us, and he was more determined than ever to make sure we saw cats when we met up again in the Mara (Bobby, aside from having a very pregnant lady, also had to coordinate the camp’s move from Northern Kenya to the extreme south-end of the country, so we bade him farewell for a few days). We made it to the airstrip where our plane was waiting, along with Rick, who, we were about to find out, was the gutsiest pilot we’d ever meet. We gave Rick a rough idea of the kind of flight we were looking for, and, since Bobby had assured us that this was the right guy for the job, we took to the skies for the most memorable flight of our lives. Low and fast was on the menu, and boy, did Rick ever deliver. We buzzed a nearby lodge where the guests were just getting up after a night of hard partying; I think it’s a safe assumption when I say that we managed to wake them up a bit. From there, we headed toward the river. We were flying low enough that we got to see the look on an elephant’s face; she was *clearly* mad that we had disturbed her morning drink. Lower and lower we went, turning almost sideways as we flew threw the riverbed. As Kevin put it, if there had actually been water in the river, our wings would have been wet. 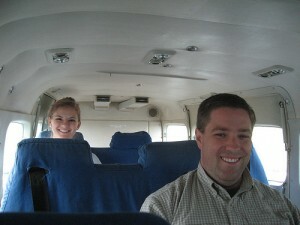 The plane was filled with laughter and shrieks; we even buzzed our lodge right before we landed. We sure know how to make an entrance, and it was an excellent way to start the 4th of July with a bang. After bidding Rick a fond farewell, we were met at the airstrip by Andrew, Hussein, and Samwel. At this point, there was no way we could have possibly known just how quickly we would become friends, not to mention how much we would value that friendship. We piled into the Rover yet again and headed over to Ol Malo lodge. Andrew, ever the gracious host, showed us around the lodge and gave us our pick of the rooms. Kevin and I chose the Crocodile Room; I was instantly in love with the giant bathtub in the shape of a croc. Dad and Dana chose Hippo 1 and 2, and all of our rooms had a wonderful little patio with a stunning view over the cliffs. Once we had settled into our rooms, we congregated by the pool with ice-cold Tuskers in hand (watch out, Coor’s Light; Tusker may be moving into your spot). By now, it was firmly established that Kevin was up for anything, so into the frigid pool he went, along with Nic, Andrew, and eventually Katharine. After some shenanigans, they finally got out, dried off (with kikoi towels!!! ), and we headed back to change clothes and get ready for lunch. Never in a million years could we imagine that we were on the verge of one of the most incredible experiences of the entire trip. 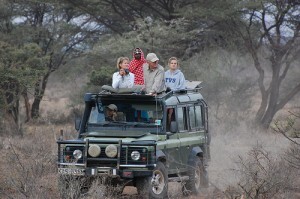 Nic and his crew managed to spot a leopard (ha! I crack myself up! ), but by the time we got over there, she was gone. Bobby was none too pleased, but we still managed to press on. We headed over to the Samburu National Reserve, aka “Giraffic Park”, and met up with the friendliest elephants you’ll ever see. One of the ladies passed so close that we could literally reach out and touch her. We shot some incredible video of a group of elephants just hanging out, and there was one that wasn’t too keen on letting us drive through; she kind of parked herself on the road for a minute before finally moving on to munch. We took our morning break on the banks of a bone-dry riverbed, and soon, the other Rover drove up and joined us. Now, at this point, I feel like I should explain something. There are (obviously) no bathrooms in the middle of the desert scrub, and our game drives typically lasted around 5 hours. Thankfully, our ever-thoughtful guides supply rolls of toilet paper in the Rover, but when nature calls, you just have to find a suitable bush. Thus far, I had managed to avoid this. I’m not prissy by any stretch of the imagination, but peeing in the middle of the African bush was certainly not high on my bucket list. Having said that, when you gotta go, you gotta go, so with said bush located, and with Kevin keeping an eye out for snakes (hello? Black mamba territory), I finally sucked it up. I know you’re so glad I shared that tidbit. Business all taken care of, we enjoyed the last bit of cool morning while we watched monkeys play in the trees and the boys acting like monkeys by the Rovers. Nic and Bobby: “Kevin will do it”. Dana and Me: “We’ll watch”. Of COURSE we ended up jumping in! 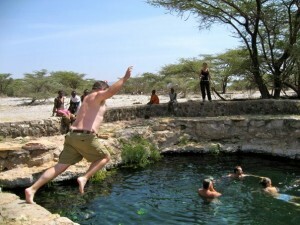 Dana executed a stunning cannonball, and we splashed around drinking Tuskers while a few local boys looked on and laughed at us. The water was astonishingly clear, but there was an abundance of slick green algae along the bottom. It was great, however, to rinse at least a couple of layers of the dust off of us. Refreshed, we loaded up and headed back to camp, where Dana and I put together a pretty good facsimile of a bushwhacker. We then made the mistake of peeking at the menu to see what was in store for us for lunch. Let’s just say it was a good thing Kevin had taken his heart meds, because I think the shock might have been too much for him otherwise. Yes, that’s right….Way over on the far side of the world, removed from everything familiar, we had TACOS. Dana made margaritas, and while the Americans thought they were tasty, Bobby and Nic looked like they had swallowed rocket fuel, and I’m pretty sure they slept it off in the afternoon. 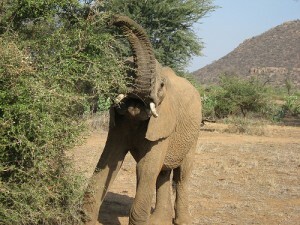 We set out on our evening game drive, intent on stopping by a dead elephant we had spotted earlier. The game wardens had already been in and taken the tusks, but the elephant was still pretty freshly dead. The hyenas had not yet had their way, so the circling vultures were having very little luck pecking through the tough hide. A few were watching and waiting patiently in the trees, but it didn’t look like they were going to be making a meal of the elephant any time soon. We were treated to a parade of elephants on their way down to the river for a bath, and we watched in astonishment as they just. Kept. COMING. There were twenty-four in all, and what a sight to see: Mommies and babies making their ways down the bank and kneeling in the river, splashing around and generally having a good time. We sat and watched them for a good 15 minutes, and we shot video of the whole event. We didn’t really want to move on, but Bobby was twitchy again. Our drive this night was short, and with no lion sightings to speak of, we headed back to Booze Hill for one last sundowner in Samburuland. To torment Bobby (which was quickly becoming a favorite past-time), Kevin played “Wondering Where the Lions Are”, which almost drove him over the edge. Meanwhile, Lepeta and Robert were fascinated by my iPod; it was the first time Robert had seen one, and I cued up “Madagascar” and let him watch. Even though he spoke no English, he *loved* watching the movie, and he was still watching when we climbed back into the Rovers and headed back to camp. It was hard to believe it was our last day in Buffalo Springs; harder still to imagine that there were bigger things in store for us. We had acclimated to Kenya in a way we never thought possible; something about her spoke to us on an elemental level, we felt an almost primal pull, and she sparked a recognition deep in our souls. 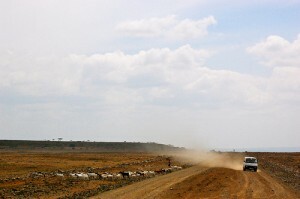 Northern Kenya is a hard and beautiful place, and it was an excellent starting point for our adventure. 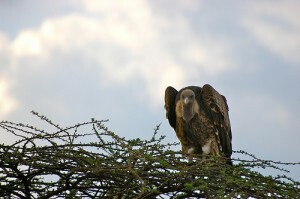 We had fallen in love with Africa in a matter of days, and, that evening, watching the vultures take flight in the distance (having given up on their elephant), we felt ourselves melt into her, and she quietly welcomed us home. The quote belongs to Brian Jackman, and boy, was he ever right. And now, if you’ll allow, I’ll continue with day 2 of our adventure. We turned in early the first night, but not before we spent a little time by the fire with a curious scorpion to keep us company. Thankfully, both Kevin and Katharine had good enough vision to spot the little bugger, so we all made it to bed unscathed. Our second day began early (we would soon realize that we didn’t have to waste anymore time thinking about our routine; it was all thought out for us), because Bobby possessed a singular (okay, obsessive) focus on finding the big cats. 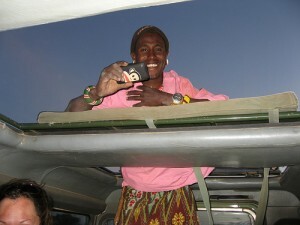 I should also mention that our wake-up calls consisted of our tent steward bringing caffeine straight to our tents. It really doesn’t get any better than that! After a little breakfast (and more coffee), we set off in our respective Rovers. 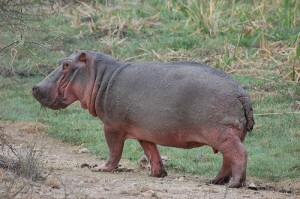 Our first stop was a hippo sighting down by the “river”. She came out of nowhere, and we watched her move surprisingly fast through the mud. 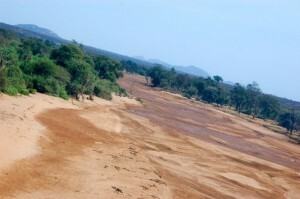 Just around the bend, still following the river, we came upon a HUGE family of baboons playing in the trees. We discovered that we could be content just to sit and watch the baboons all day. They truly are fascinating, and their social dynamics aren’t all that different from ours. We began to spot something else moving in the tall grass by the river, and Bobby inched our Rover forward a little at a time so we wouldn’t scare anything off (plus, since he was obsessed and all, I know he was secretly hoping for a pride of lions). 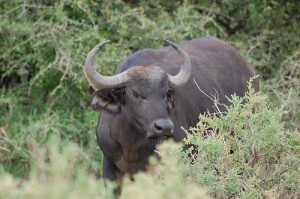 It turns out we needn’t have worried, because emerging from the brush was a HUGE herd of Cape Buffalo. There’s definitely a reason why these are one of the Big Five. These enormous creatures constantly look like they’re pissed off about life in general, but we never felt threatened by them, even though we were repeatedly warned that they have been known to charge. 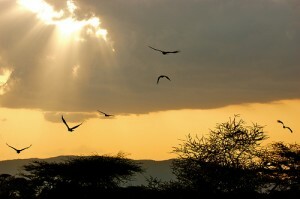 We watched them for a while, still a little sad to leave the baboons behind, and pressed on. We wound our way around between the desert scrub and the river; at this point, I think it should be noted that, because of the severe drought, the river was nothing more than a trickle in most places. I mentioned before that our party of five was split between two Rovers: Nic captained the Rover with Dad, Dana, Katharine, and Lepeta, and our chariot was driven by Bobby, and we had Robert as our Samburu guide. One of the most memorable images that we took away was the sight of Lepeta’s bright red blanket in the other Rover somewhere in the distance, and, on this morning, we spotted even more wildlife on top of the vehicle as we came upon another family of baboons and a mommy elephant with her newborn calf. Bobby had promised us crocodiles, though, and he was eager to press on (especially since he still hadn’t spotted any cats. He was beginning to get twitchy). By this time, the sun had begun to peek through, and it was about time to stop and have a drink (no, not THAT kind of drink; it was still morning, so we opted for water). We pulled up to a riverbank, and Bobby shut off the Rover and said “Let’s hop out”, which, naively, we did. No sooner had we wandered towards the bank than we heard a large splash immediately to our left. 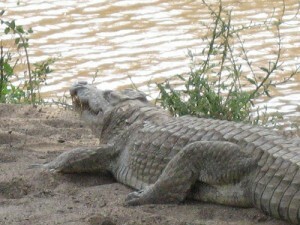 A HUGE croc had just dived in the water, and there was another big boy directly in front of us. Now, a Nile crocodile is certainly a sight unto itself; we saw about TWENTY. Some were sunning themselves on the bank, but most were swimming around in the river. The biggest guy we saw was somewhere around 15 feet long, and he just sat there and let us watch him. Never in my life did I EVER think I would get within spitting distance of a Nile crocodile, and, needless to say, I had a little buzz the rest of the day. We piled back into the Rover and headed back out into the scrub. We saw lots of impala, more gerenuk, lots of Grant’s gazelles….and then we ran into ANOTHER large baboon family. 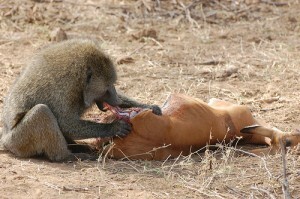 This time, though, Big Daddy Baboon was having himself a snack….of a dead impala. Baboons do not normally eat meat, but again, the drought is so bad that all the animals are doing whatever they have to in order to survive. We watched this guy for a little while, and it was especially interesting to watch the pecking order in action. Big Daddy was clearly going to eat his fill before letting anybody else have a go. By this point, the sun was out in full force and the day began to really heat up. I can’t even begin to describe how dusty it was, either. There were several mountains nearby, and they were virtually undetectable when the sun started to bake the dry earth. The dust rose in huge, all-consuming clouds, turning everything into a pale rust color. You could actually taste the dust in the back of your throat. So, because we were hot and dusty, we headed back to camp for lunch. Nic and Bobby taught Katharine how to play backgammon, and even though Bobby cheats, she soundly beat them both. After lunch and our afternoon nap (seriously. We napped every afternoon. Naps in the afternoon, booze at sunset…yeah, now you’re beginning to understand why nobody wanted to come home), we set out on foot in lieu of a game drive. Now, there’s something to be said for experiencing Africa on foot, especially since, oh yeah, there is stuff out there that will kill you. Thankfully, we had armed guards with us, but honestly? I put WAY more faith in Lepeta and Robert. 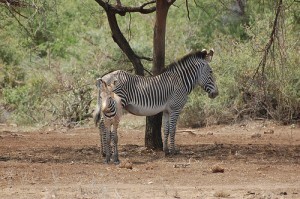 We encountered several giraffe, some zebra, the ant lion (one of the Little Five), and more than a few antelope. 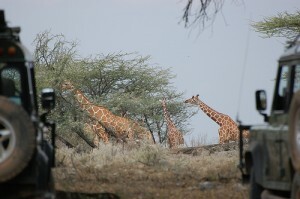 The giraffes, who couldn’t care less when we were in the Rovers, became extremely skittish when they saw us on foot. We gave them a wide berth and headed back to the top of Booze Hill. We had an amazing ivew of the shallow valley spread out below us, but the sun was beginning to sink rather rapidly, and even our Samburu guides were picking up the pace. Lions, after all, are nocturnal. We walked back to camp, and this night, instead of Mozart, we were serenaded by Lepeta’s and Robert’s quiet singing in Swahili and the wind in the acacia trees. After about 7 straight hours of sweet, sweet sleep, I finally woke up somewhere over Ethiopia, and we had about 90 minutes left in our flight. Kevin and I were in our own little cocoon in the middle of the plane, so we had no real point of reference out any windows, which was probably just as good, since it was pitch black outside. After a rather bumpy touchdown, we were greeted at the end of the jetway by the incomparable Willis, who took our passports and directed us to baggage claim, where, lo and behold, our bags were already waiting. Willis reappeared, and then Bobby met us and herded us to the van. We literally spent all of 10 minutes in the airport, and at no time did we have to hassle with ANY immigration line. 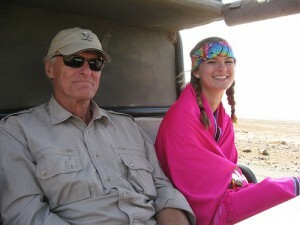 So far, Royal African Safaris was treating us like, well, royalty. We headed out of the city center and to Ngong House. The drive took about 45 minutes, and even though it was nearing 11:00 PM, Paul met us and arranged for dinner (which was CRAZY good). After one last hurrah on the internet, we headed over to our tree house for the night. I can’t even begin to describe how beautiful it is at Ngong House; the grounds are filled with the biggest bougainvillea you’ve ever seen. We were awakened with coffee and hot chocolate on our patio (helloooooo Kenyan coffee….I heart you so much), and after a shower, we headed over to the main house for breakfast. Paul sat with us for a bit, and then Bobby came to fetch us and take us to the airport, where we caught our 1 hour flight up to Buffalo Springs. Even though it was seriously overcast when we took off, we were fortunate enough to be able to see Mount Kenya from the plane. It was a stunning sight, to say the least. The descent was bumpy, but we made it to the airstrip in one piece. 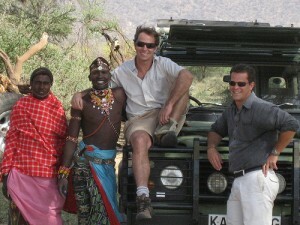 We were met by Nic (our other guide from Royal African), Robert, and Lepeta (our two Samburu guides), and we began the long game drive to camp. We were instantly fascinated by everything we saw, and we must have been making poor Bobby crazy. 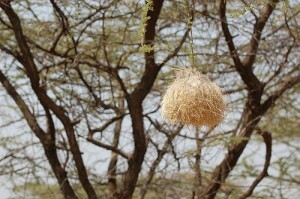 We immediately spotted some gerenuk (an antelope which dislocates its hips in order to reach the higher leaves of the acacia) and several weaver birds’ nests. The drive in was a big wake-up call for both Kevin and me. As we made the 90 minute trek to camp, we passed lots and lots of lion tracks, and it really hit us that there was stuff out there that would kill us. Sure enough, once we got settled in at camp, Bobby gave us what he referred to as the “Pep Talk”, and he reminded us not to wander further than the perimeter of the camp as well as not to go outside of our tents once we were settled in at night. Sure enough, sleeping was a little bit of a challenge that first night in camp; there are LOTS of sounds to contend with, and it was hard to tell the difference between a roaming gazelle or something bigger. The coolest thing about the first day, though, was the herd of giraffe that made its way through camp. We passed them on the way in, and by the time we had lunch and settled in for an afternoon rest, they had decided to check us out. They skirted around the perimeter, going from tree to tree munching on acacia leaves. There were about 10 of them in all, and they watched us like “What are you doing here? Don’t you know you’re in the middle of nowhere?”. 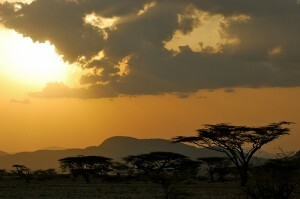 We ended that day with an evening game drive and our first sundowners (I MISS sundowners!). We drove up to Booze Hill (really. Booze Hill), and Lepeta and Robert poured the wine while we watched our first African sunset. There’s definitely a reason why watching the sun sink down is an event unto itself in Africa; it’s the most beautiful spot in the world to watch day turn into night, and you never forget your first. That evening, with a glass of wine in hand, the sun painted the sky every shade of orange, red, and yellow, and zebras roamed in the distance. We listened to the brush settle in for the night along with the sweet strains of Mozart (seriously. We listened to Figaro that first night while the sun went to bed). And I experienced first hand how very small I am in this world, but how much I love exploring it. It’s taken a while, but I’m finally back into some sort of routine after our AMAZING trip. Now the plan is to get some of the highlights written down here instead of just in my travel journal. 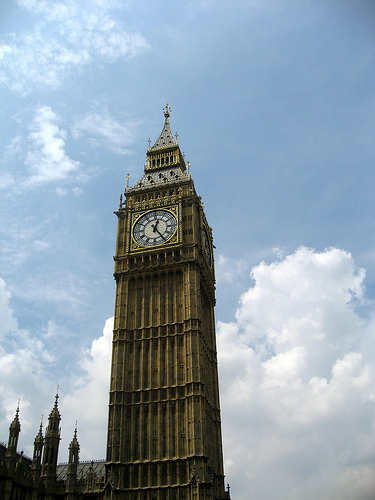 I figured I’d start today with our stopover in London…. 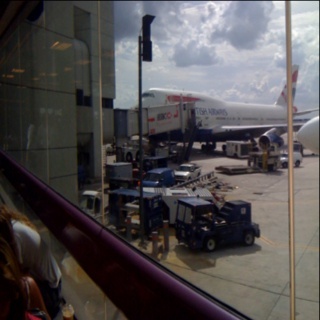 We started out from Miami on the upper deck of a British Airways 747. I had my ritual pre-flight Bloody Mary, a couple of glasses of champagne, and 2 sleeping pills…all before they served dinner! Once fed, we stretched out and got a little bit of sleep (side note: the beds are actually more comfortable than the guest bed at my in-laws house. Seriously). 8 short hours later, we landed in London. One of the great things about flying Club World on BA is the Immigration Fast Pass; we got to avoid the crowds and waltz right to baggage claim. Our car was waiting for us, and we went to the hotel to drop our bags. After a little breakfast, we walked through Kensington Gardens and Hyde Park over to Speaker’s Corner. We had a little bit of time before lunch, so we hit the Tube (side note: lots of stations are closed on the weekends while they make improvements for the 2012 Olympics) and went over to see Big Ben, Parliament, and the Eye. We had a wonderful lunch at Maggie Jones, and by then it was finally time to check in to the hotel. After the second best shower of my life, we ordered a little dinner and then collapsed into bed. Sunrise came at 4:15, and it was magnificent. We had a lovely view from our room of not only Kensington Palace and the gardens, but also of the torch that’s being built for the Olympics. It was truly spectacular. 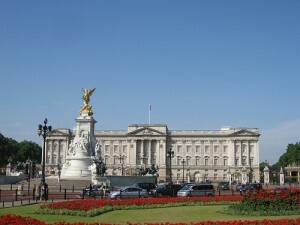 We got an early start and headed over to Buckingham Palace. We then took a little stroll through St. James’ park on the way back over to Westminster Abbey, Trafalgar Square, Big Ben (again), 10 Downing Street…..Yeah, we did a lot that day. The Abbey was an unplanned stop, and we were both glad we saw it. It was breathtaking, and not a little awe-inspiring. We saw tombs of kings and queens, of poets and adventurers, and we even saw the Coronation Chair (it’s REALLY little!). It was especially cool for me to see the tombs of Stanley Livingstone, Charles Darwin, and of course, Henry V.
We headed back to the hotel around 4:00, and then ALLEN came to visit!!!! Drinks happened, then dinner (where our group met up with MORE people from back home), then more drinks. We had a wonderful visit with him, and I’m so glad we got to see him even though we weren’t there nearly long enough to really catch up. I could have stayed up all night talking with him, but it’s probably best I didn’t….especially since I ended up with the mother of all hangovers the next day! The next morning came excruciatingly early, but the fine folks at British Airways were kind enough to supply me with a new eye mask and earplugs…and a LARGE bottle of water to wash down about 5 aspirin. I slept it off on the 8 1/2 hour flight to Nairobi….